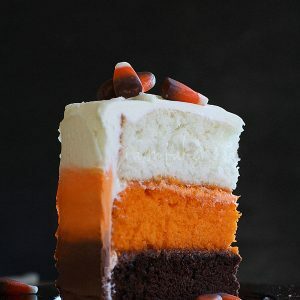 This cake is completely inspired by candy corn. But not the regular candy corn, Brach’s Indian Corn. Bake chocolate cake in 8in round cake pan. One cake will be used, so you can wrap the other 8in round cake and place in freezer. Bake white cake batter in 8in cake pan and bake orange cake batter in 8in cake pan. For frosting, take one container of white frosting and tint it orange. I used gel food coloring and about 4-6 drops. Place chocolate cake on cake stand. Place thin layer of chocolate frosting. Place orange layer on top and cover in thin layer of orange frosting. Finally, place white cake on top and cover entire cake in crumb coat.